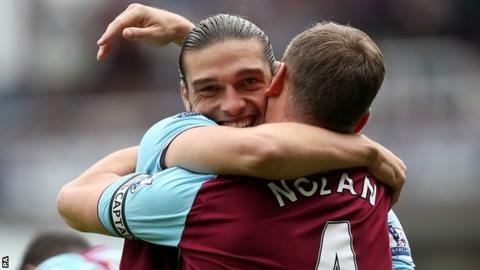 West Ham manager Sam Allardyce believes striker Andy Carroll's goals can secure a top-10 finish in the club's first season back in the Premier League. Carroll, 23, joined on loan from Liverpool last week, and excelled on debut in the Hammers' 3-0 victory against Fulham at the weekend. "If Andy gets 15 to 20 goals, we can get in the top 10," Allardyce said. "All we have to do is produce enough clean sheets to make sure we get points on the board with the goals he scores." Although Carroll was unable to score in his first match, his aerial prowess and link-up play proved too much for Fulham's defence to handle. Allardyce will now want him to repeat the goalscoring form which enabled him to score 31 goals in 80 league appearances for Newcastle rather than his return of just six Premier League strikes in 44 appearances for Liverpool following his record-breaking £35m move in January 2011. He continued: "If Andy scores between 10 and 15 goals, it is going to give us a great chance to be out of the relegation zone. "Andy's going to be our main man and you've got to get people supporting him. I thought the support [against Fulham] from Matt Taylor and Ricardo Vaz Te was superb alongside Momo Diame." Against Fulham Carroll - who will miss England's upcoming World Cup qualifiers against Moldova and Ukraine with a hamstring injury - and captain Kevin Nolan rekindled the profitable relationship they enjoyed while at Newcastle, and Allardyce hopes his side can benefit from the pair's understanding. "You can look at what happened at Newcastle in the first year when Kevin Nolan could feed off Andy," he said. "By the time Andy had been transferred to Liverpool, he had scored 11 goals and by the time Kevin had finished the season, he had scored 13 and they were really comfortable in the division."